Since getting engaged last December, I’ve at many times felt like an conflicted bride to be. Firstly, I had an uneasiness with the F word I was supposed to be using, mainly because I couldn’t say it without also thinking or saying, ‘I lost my fiancee the poor baby!’ As excited as I was, it didn’t outweigh the odd feeling of pretentiousness using certain titles. So we settled on husband to be, and me, quite literally, the bride to bee. Next came another popular topic, wedding registries. I don’t need one being my answer to the continually asked question. But I was soon corrected by just about everyone. With my engagement came the notion of being unique, and fighting tradition as much as possible. A feat which, at times, has been harder than anticipated. I’ve begun to learn that sometimes the more you fight something, the more you should just accept it. So I accepted tradition but on my own terms and with a twist. Enter Zola, the personalized wedding registry for the chillest of brides. 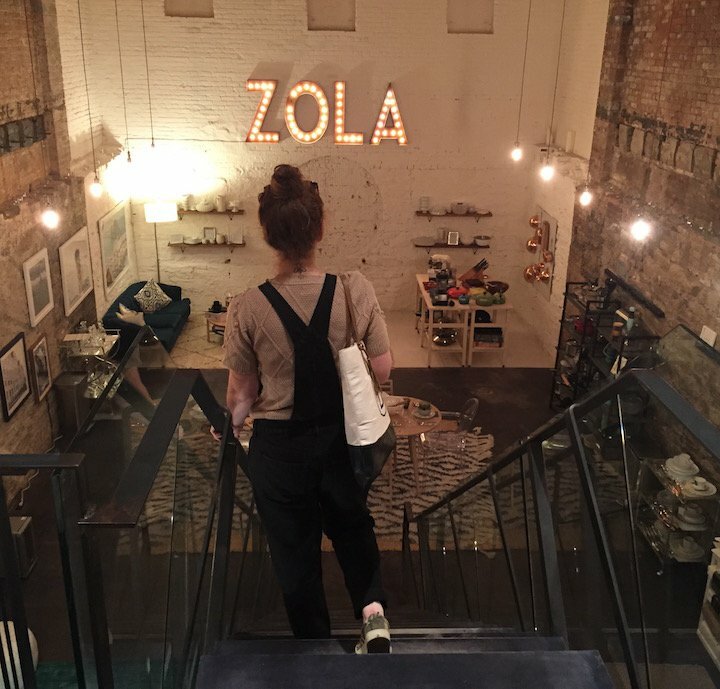 I first got introduced to Zola earlier this summer when I spent time at their pop-up. The Soho townhouse contains some of their best offerings; an eclectic mix including both hotel level luxury bedding, housewares, and one of a kind local and national experiences. Zola understands not every marriage is the same which is why they place such a high importance on individuality. Weddings aren’t cookie cutter, or a standard template anymore, so your registry shouldn’t be either. I was 31 when I met my soulmate, and we had each already acquired lots of essentials each. Our wedding isn’t commencing with a ribbon cutting ceremony at our new house. We live in a New York City apartment and an overload of home accessories is not only unnecessary, but undoable in our city space. 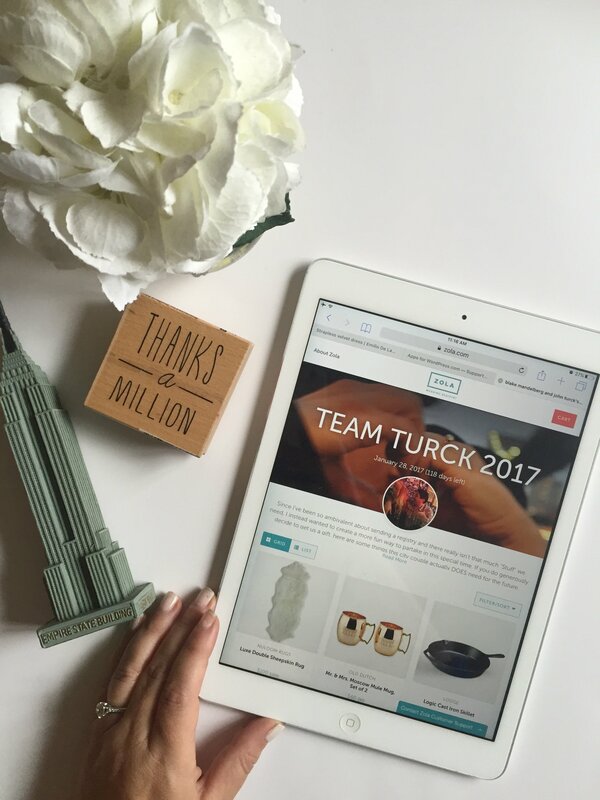 So when it came time to stop fumbling and give answers to very generous and inquiring minds, I turned right to them to create my own, unique registry. Overcoming hesitation, I shifted focus to thinking about what the new ‘we’ really could benefit from. It wasn’t china, or a Tiffany bowl, or sterling silver corn holders. (Although all those things are lovely.) A collage of components making up each couple’s new beginning could include a variety of things. Some more basic, and others a little more personal. Think of it like a giant Pinterest board of everything you need to start your life together. Zola can’t ensure a happy marriage; only we hold the key to that formula. But as I learned, it can make it uniquely stylish. 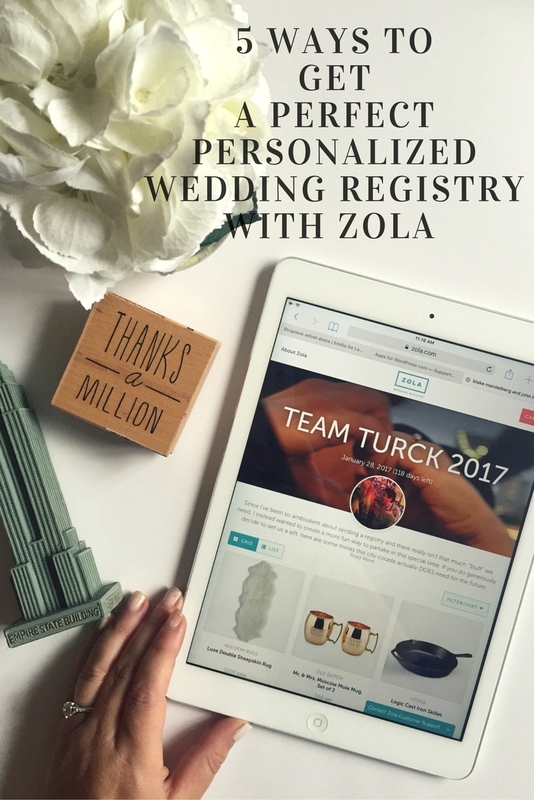 Here are 5 ideas for creating a personalized wedding registry with Zola. Design a registry that reflects you both as a couple. Every couple has their own edge, that thing that makes them special. Are you more free spirited and indie? A chic, metropolitan duo? Maybe your style is less focused and more eclectic like mine. Whatever it is, illustrate that special something through your Zola registry. Include a honeymoon. Everyone deserves one, but not everyone has the luxury of actually taking one. A way to include guests, and make them feel like their gift really is being put to good use is to include a honeymoon on your registry. Make it a group gift, and people can contribute any amounts they want. Make a cool header and a short message. A personalized wedding registry isn’t complete without a few pictures of the couple, even if are on the more camera shy side. Ours includes one from our Downtown Manhattan shoot; the best I could muster up in a few, chill, engagement Annie Hall-esque pictures. Share & customize your own gift. Zola lets you to choose from hundreds of fabulous options on their own site, but it also allows you to add from anywhere else too. When I realized this was the perfect occasion to ask for that new Foreman grill we desperately need, (and since they’re not offered on the site), I found, and added one to my list. You can choose to have guests either send money to buy the item yourself (which Zola encourages for an easier user experience), or direct them to the site to buy and ship themselves. Add a special experience. 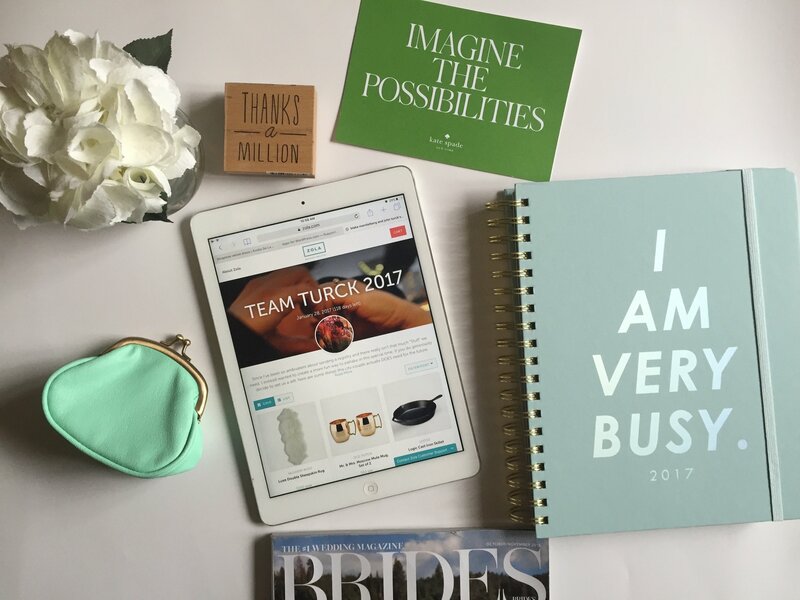 The perfect way to truly customize your wedding registry is to make sure you add something special or meaningful to you. Perhaps that’s something as simple as a dinner out on the town, or maybe for the more daring couple, a skydiving adventure. For me personally, it was a cheese of the month membership because I’ve always dreamed of having one. And if a bride can’t, for that one day, get the cheese she’s been planning and praying for, when else can she, I ask? thanks for sharing , very helpful for my wedding in 2017.